Before they even stepped in the ring or throw a punch, Floyd Mayweather and Conor McGregor has already guaranteed a combined windfall of more than $150 million for their Las Vegas superfight. Once all the revenue floods in and all the money is counted, hundreds of millions of dollars will have been grossed by ‘MayMac’ – the boxing legend vs UFC megastar bout that may become the richest fight in combat sports history, despite also being a novelty exhibition match. Here are the dizzying numbers. It’s been loosely tagged a billion-dollar fight – it’s not but it is being tipped to smash all records. Mayweather vs Manny Pacquiao in 2015 had estimated revenue of about $600 million, while Mayweather vs McGregor has been touted to exceed $700 million, via US pay-per-view buys, ticket sales and other sources of income such as merchandise. As you’d expect, Mayweather Promotions and the UFC are talking a good game, especially amid somewhat soft ticket sales, so whether the May-Mac fight does actually surpass MayPac remains to be seen. The Nevada State Athletic Commission discloses the fixed payments of fighters on cards within its jurisdiction. On the eve of the fight that Mayweather and McGregor made a combined $130 million just to show up. 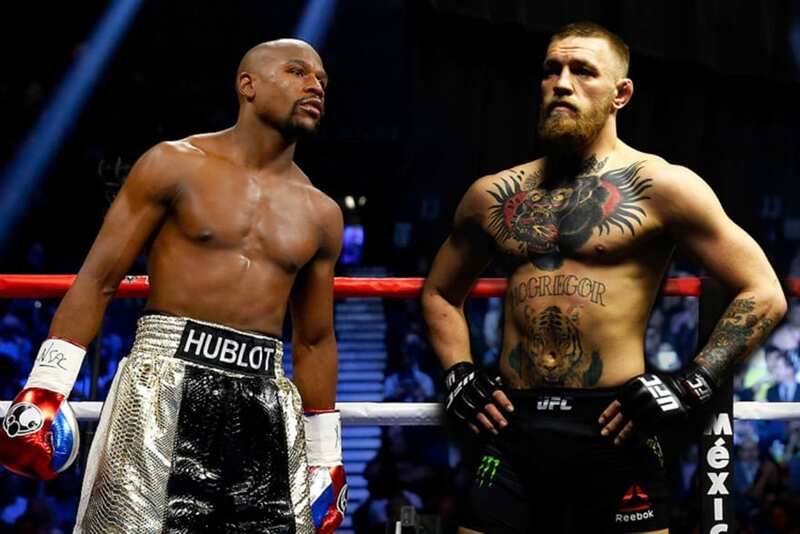 Mayweather backed up his ‘A-side’ claim in knockout fashion – he gets $100 million guaranteed, McGregor ‘just’ $30 million. Pay-per-view points are where the fighters make their truly astronomical figures. After a share of PPV revenue (plus sponsorships and other incomes), Mayweather has boasted that he could make $300 million, while McGregor expects to surpass $100 million. “Just being real. They call me ‘Money Mayweather’ for a reason,” Floyd told FOX Business. Mayweather, of course, owns Mayweather Promotions – meaning he collected the windfalls due both the event promoter and No.1 star. The UFC’s cut, as McGregor’s primary promoter, has been reported at an estimated $50 million, while Conor’s own promotion brand – McGregor Sports and Entertainment – has emerged amid the heady creation of the superfight and ‘The Notorious’ will make about triple his biggest UFC payday through his appearance purse alone. UFC president Dana White claimed in the build-up that the fight was tracking to break the all-time pay-per-view record, hitting nearly five millions buys in the US. “We’re gonna do the numbers that everyone has been talking that we’re going to do. The line in Vegas, the over/under, is 4.9 million [buys]. Everything is tracking right now to say that we’re going to kill this thing. So it’s looking really good,” he said on a conference call. The PPV record, of course, already belongs to Floyd. Mayweather vs Pacquiao did just over 4.6 million buys for revenue around $455 million. Being a high-demand fight, US broadcaster Showtime has charged a premium $99.95 for May-Mac on a HD home PPV. The enormous buy rate in the US, combined with another 200 countries in which the fight is set to air, will again ensure a colossal revenue stream numbering in the hundreds of millions of dollars. Another tidy earner will come via closed circuit viewing parties on the Las Vegas strip in MGM Resorts properties – generally at $150 per ticket, expected to reap more than $7 million from fans lacking the cash to attend the fight live. Bars in the US pay a per-head rate to screen the fight, based on their occupancy, and may account for a further $15 million revenue. Ring sponsorships: $5 million; Robe: $1 million; Shoes: $1 million; Weigh-in trunks: $1 million; Victory hat: $1 million; Walk-out cap: $.5 million; Fight shorts, front waist: Over $3.5 million; Fight shorts, front seams: $3.5 million; Fight short, rear centre: $3 million; Fight short, rear waist: $2 million; Fight short, front thigh: $1.5 million and fight short, rear thigh: $1.5 million. A betting company has purchased the space on just the ring cushion behind Mayweather’s head for a cool $3.1 million. ‘Money’ is also backed by a long-term endorsement with Swiss watchmaker Hublot. It is not known just how well McGregor has cashed in on sponsorships, though he’s been spruiking a number of products for which he has endorsement deals, such as Beats By Dre, Budweiser, Monster Energy and Rolls Royce. MayMac presented an enormous opportunity for the MMA megastar, who was not bound by the UFC’s Reebok deal, which limits fighters to an apparel fee for their fightwear (Conor reportedly made $40,000 last fight). The state of play from the outset has been that lower average ticket prices were expected for May-Mac compared to MayPac, because this is an exhibition match rather than a championship fight, yet with Mayweather vs McGregor a chance to break Mayweather vs Pacquiao’s gate record because it is at a bigger arena. MayMac is at the 20,000-seat T-Mobile Arena in Las Vegas, while MayPac was at the MGM Grand Garden Arena, taking a record gate of $72,198,500 million from 16,219 tickets sold – an average ticket price of $4451, before even taking into account the secondary ticket market’s hefty mark-ups from face value. May-Mac’s average ticket price has been reported at $3,521 and there are still quite a few tickets available due to the lofty prices for an exhibition bout. So just how much for MayMac tickets? Just before the fight individual tickets were still being offered on T-Mobile Arena’s Ticket Experts site for between $1200 (nose bleed) and $74,000 (suite). Some ringside seats reportedly sold for more than $100,000. The WBC unveiled a jaw-dropping prize for May-Mac at the pre-fight press conference. The Money Belt is made of alligator leather, with 1.5kg of solid 24-carat gold, 3360 diamonds, 600 sapphires and 300 emeralds. Vegas sports books have taken multiple bets in excess of $1 million for a Mayweather victory. Bookies worldwide are reporting that a McGregor victory would be a disaster, with bets on the Irishman hitting them in some cases at a rate of 20-1. However, Vegas bets for McGregor have averaged in the low hundreds, while one bookie’s average bet for Mayweather was about $8000. MayMac has been touted as the biggest betting fight of all time, exceeding the $60 million held with US bookies for MayPac. Mayweather reportedly attempted to lay $US400,000 on himself to win in under 9.5 rounds, but the bet was denied; the Las Vegas bookies citing ‘concerns over the legality of a fighter betting on anything other than a straight win’.